We arrived at Erebus in the late afternoon hours of a sunny summer day and if that didn’t seem strange enough, there in broad daylight was a drooling zombie who worked the queue line that wrapped around the side of the imposing structure. The haunt season had come early and it felt bizarre, surreal and almost as if we had all cheated in some way. 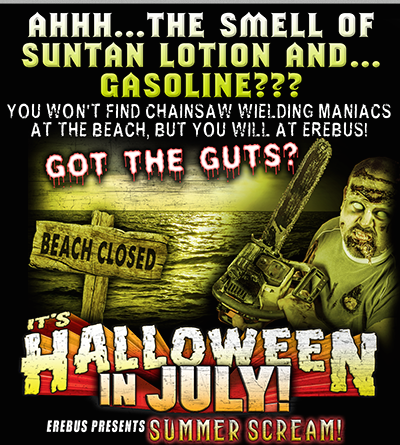 The Summer Scream Total Blackout event at Erebus had the feel of a wild card and by the time we had emerged from the haunted edifice it was with a mix of emotions and thoughts on our latest trek through the monster Erebus. For my stalwart haunted house companion Disco Devil and myself, it was our sixth trip through the 4-story haunted edifice but with us we also brought our friend and Erebus virgin, Cikalo. 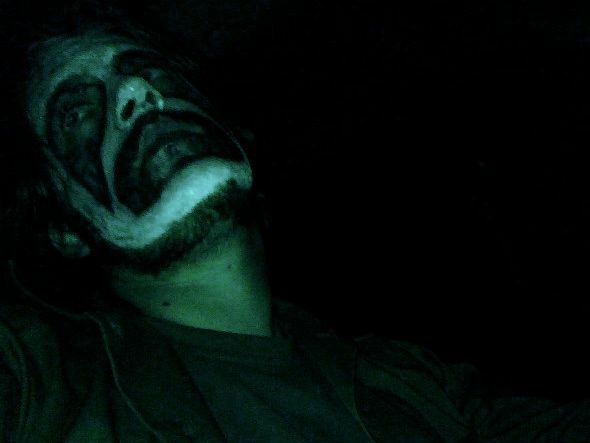 He’s joined us on a handful of excursions since 2011 and I was very interested to hear his thoughts on Michigan’s most well-known haunted attraction. Despite a fair crowd our wait to enter wasn’t overly long and we were soon handed glow-in-the-dark necklaces to wear through the haunt — our only apparent means to light the path ahead. I was disappointed with the necklaces because I had hoped for a glow stick so that I could hold it aloft like a torch and light the way as if I was some kind of modern day Indiana Jones. I suppose management felt that a glow stick was much more likely to be dropped and lost than a necklace, and thus my cinematic fantasies were dashed. Our journey began as all of our trips through Erebus have — first with a brief stop in front of a large video projection and then a few moments locked inside the scanning chamber. Each of these are fun but after so many years something fresh would be a welcome change. John and I had visited Erebus as recent as last fall, so it was no surprise that the layout of the attraction was relatively unchanged but the operators had implemented various tweaks and twists. A serpent burst forth from the vase near the Snake Charmer, a moving wall threatened to cast us into a bottomless pit, a wrecking ball sprung from the darkness and crashed into our path and we were made to kneel in the buried alive chamber. Present also was, of course, the usual legion of actor-controlled puppets that I affectionately refer to as lurchers, leapers and grabbers. A number of these puppets were quite aggressive, on several occasions a member of our party found themselves ensnared by their hairy clutches. Elsewhere in the belly of the beast, a pack of crazed monkeys descended from the ceiling and one of the sneaky simians nearly snatched the hat from my head! Moments later, while we traversed the liquid sky corridor, a strategically placed ghoul popped me right in the face with a bloody stump; who doesn’t like a bloody stump to the mush? A couple of actors of note included the large fellow who stalked the hall of mirrors, which made for an interesting and eerie setting under the dimly lit conditions, and also Dolly Boy who seemed lost in a fantasy land where toys could speak and was only peripherally aware of our existence. It was during the early stages of Erebus that I believe the haunt was the darkest and it was at this juncture that we witnessed several solid jump scares, but on the whole the attraction did suffer from subpar acting and an excess of light for an event that was billed as a total blackout. I knew heading into the event that it would be difficult for Erebus to pull off such a feat because the animatronics and various special effects, that indeed make Erebus what it is, are dependent on at least some light. Regardless, I would have personally preferred to have these visual aspects sacrificed in the spirit of the event. The glow necklaces gave off a decent amount of light as it was and alone may just have provided just enough illumination to truly create that lost in the darkness sensation. The acting as I mentioned left something to be desired; many of the actors didn’t seem equipped to effectively interact with guests once initial contact had been made. The immediate scare wasn’t bad but there wasn’t much there in the way of dialogue or unique mannerisms and often one after another became a generic blur. An army of actors who are essentially little more than worker bees can be pulled off without detracting from the show, in fact we’ve witnessed it on numerous occasions at Erebus, but on this night there simply weren’t enough characters with substance to balance the equation. In the end, we did enjoy this trek through Erebus but it wasn’t the total blackout we had hoped it would be and because of that we couldn’t help but feel like we’d just traversed Erebus on a night where some of the lights simply weren’t working. With that in mind, Cikalo, who again had never toured Erebus, commented that he would’ve preferred to have seen it all full power. For all of these reasons, I hope that if this event is held again that the operators see fit to take the concept further as to truly differentiate the Summer Scream Total Blackout from the fall production. 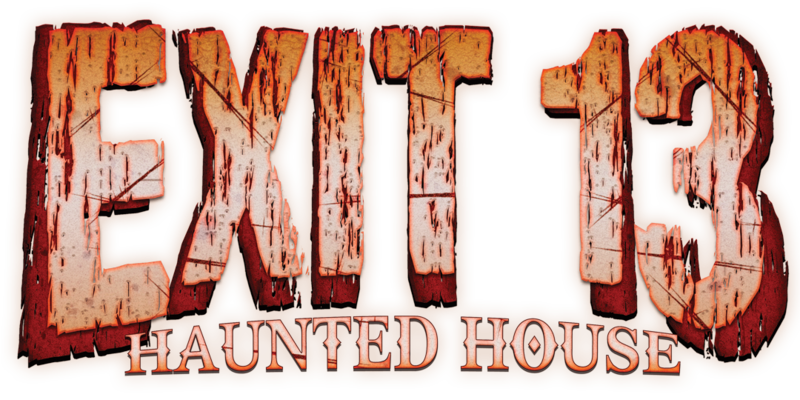 The one thought that kept swimming to the surface of my mind was just how strange it felt to be at a haunted attraction in the middle of July, and as I sit here and share my thoughts on that day I’m still struck by that feeling. There’s no doubt that there’s an unmistakable element of magic in the air during the haunt season and for whatever reason it just wasn’t there on that summer day. Now that’s not to see that we didn’t have a good time because we did — I guess it was sort of like eating ice cream in the winter; it was simply out of season.